I love a good celebration. Every year we celebrate Robert Burns Birthday, National Toilet Paper Day, National Ice Cream Day, Earth Day as well as the better known national holidays like Fourth of July, Christmas, Thanksgiving and so on. Typically, I post about the celebration on the actual day. For example, you will see pictures of us in our business suits on October 13 which is International Suit Up Day. I am taking a break from that tradition and posting a celebration early this year. This year I am celebration "Talk Like a Pirate Day" for an entire week - not just a day. Talk Like a Pirate Day is September 19. It may be one of the lesser known holidays but it certainly is not going away. It seems to attract more and more paRRRty goers every year. 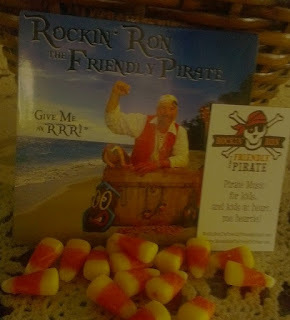 This year I was thrilled to receive a copy of Rockin' Ron's CD "Give Me an RRR" to help me celebrate this most silly of occassions. Rockin Ron the Friendly Pirate has an entire CD of Pirate Songs and even one dedicated to Talk Like a Pirate Day. This CD arrived in the mail yesterday and I immediately opened it up and imported it into my iTunes so that I could play it on my iPod. The music seems to be intended for kids and my youngest is 14 and so I really have no excuse to be listening to this one. But I turned up my speakers and let it play while I finished some most unpleasant paperwork and it brought a HUGE smile to my face. With songs like Cranky Pirate, Pira-TUDE!, Twinkle Twinkle Little StaRRR, and Buccaneer Bounce, how could you not giggle a little bit. I don't think you have had to live through 8 years of Barney the Purple Dinosaur and come out the other side with most of your sanity still intact to really enjoy Rockin' Ron (but it might help). It might help if you love a good pun or if you sit around with your kids and tell silly jokes. Regardless of your goofball level this is the perfect CD to add to your Talk Like a Pirate Day lineup. Celebrating Talk Like a Pirate Day without Rockin' Ron the Friendly Pirate's CD would be like trying to celebrate Oktoberfest without Lawrence Welk and Myron Floren's Worlds Greatest Polkas CD (I have this CD too and play it every Oktoberfest - it has all the classics including the Duck Dance). FULL DISCLOSURE: I did receive this CD as a gift and there were no expectations that I would write a glowing review of it but how could I not. In full disclosure though I must say that there is one Pirate Rap song on the album that I'm not a huge fan of but there really isn't anything Rockin Ron could have done about that because almost all rap, especially Pirate rap, makes me cringe just a little bit. The only kind of rap that makes me cringe more is Grandma Rap. So, get out your eye patches and put on your puffy shirt. It's almost time for Talk Like a Pirate Day.